In 2014 we featured Cavan flute player Ellen O’Brien after she had won the Ulster Flute Under 12 competition for dance tunes and slow airs playing a Martin Doyle Flute. Ellen then went on to win the All-Ireland competitions in her age group soon afterwards. Four years later a video clip of Ellen playing the Tom Ennis reel The Morning Thrush was posted on Youtube. At the time Ellen was doing a work experience stint at the Celt Centre prior to the June 2018 County Fleadh Cheoil in Kilnaleck, County Cavan. 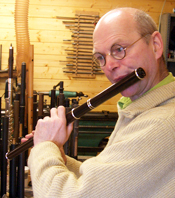 Ellen is playing a keyed Martin Doyle Flute made of African Blackwood. This entry was posted in African Blackwood, Dance, Flute Players, Irish Traditional Music, Keyed Flutes, Martin Doyle Flutes, Musicians, Video Clips and tagged Cavan, Cheoil, County, Ellen O’Brien, Fleadh, Flute, Kilnaleck, player, reel, The Morning Thrush, Tom Ennis on 13th February 2019 by Admin.